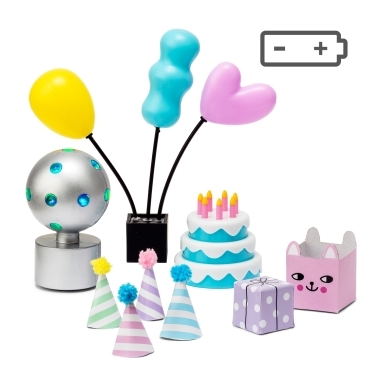 This set let's you create your own party or birthday party in the dolls house. You get a disco lamp that rotates and lights up in all different colours. The disco lamp is powered by batteries and fits all of Lundbys dollhouses, or it can stand alone anywhere in the children's room. A bunch of three brightly colored balloons and a delicious cake are also included. For the party guests, there are two packages to give away and four party hats to wear to get everyone in the party mood. Together with the Party wall set for the Lundby Creative Dollhouse, the party will be perfect! 1 battery (CR2032) included. We list the retailers that have purchased this product lately. This, to guide you to stores that have it in stock.